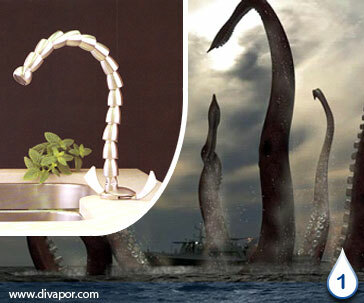 The Kraken faucet? Well, not officially, but this kitchen faucet tap by Ritmonio Dumbo certainly does bear resemblance to a reptilian or a mystical sea beast. The faucet gives off a real aura of attitude which gives it a lot of appeal, but unlike its animalistic Kraken cousin, this beast comes in chrome or chrome-satin and it's reptile like scales allows unparalleled flexibility with its 30cm articulated spout, so you can easily direct it onto your tomatoes and carrots when giving them a rinse. As long as this tap doesn't show signs of wear on the chrome satin finish I don't think you could go wrong with it. Very original. 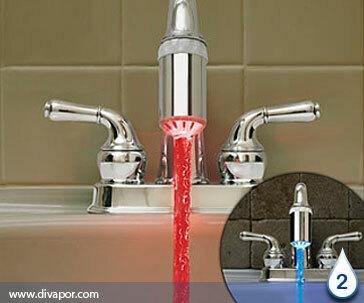 This tap by Think Geek really does catch the eye with its impactive flow of arctic ice water and hot lava flow water. While the water itself isn't coloured, the lights contained within the tap travel down the column of water giving the vivid illusion that the water is a different colour. It gets even better though, when the water temperature is below 89 degrees the light will shine blue, but as soon as the water temperature tipples above 89, the light turns red. At only $19.99 it might be worth getting one; at least for the temporary entertainment value it gives, and the comments you'll get from your visitors. This is a really interesting one. 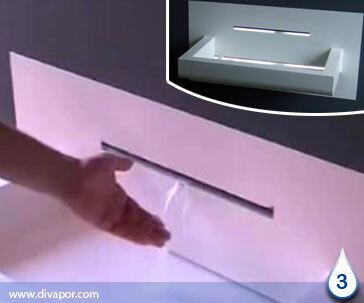 This 'faucet', or should we say 'water dispenser', actually sprays water out and follows the movement of your hands from right to left (if that doesn't makes sense, look at the video). The great thing about this is that it isn't just a pointless gimmick but rather a way to change the temperature of the water. When your hands are to the left of the 'slit' the water will be hot and as you move your hands to the right it will get cooler (quite an apt word for this faucet!). We have to give it to Jalmer Moorman for this ingenious original design. 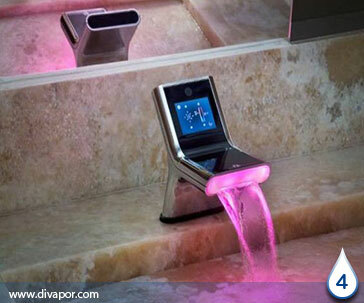 This Smart Faucet tap by ihouse can only be described as something you'd see in a futuristic movie like I, Robot. It may just look like a tap with a little screen on it which you may assume allows you to change the temperature of the water digitally. That in itself would be quite a special faucet; however, this one takes it to the next level. A user can program in their perfect temperature and when every time they go to wash their hands, the tap will recognize you by your face and will then load your desired settings. 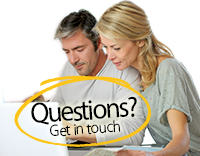 Apparently, the touch screen on the tap can be used to access and read emails, see what the outside temperature is and also check your scheduler. With all the smart phones out there on the market today, I can't see there being much practical use to having those features on a bathroom tap - but hey, that's just my opinion. Now this Kohler's Karbon tap actually looks like it could be very useful. It looks like one of those robotic arms which assemble automobile car bodies. 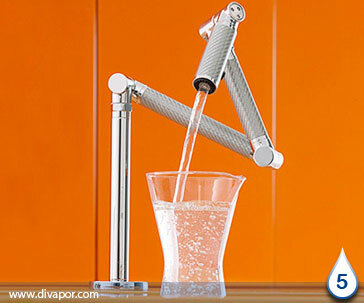 The Karbon has definitely not sacrificed functionality and practically for the sake of a futuristic design as the tap has a smart robotic arm which can move to all areas of one's kitchen sink. The arm has been designed to stay in one place once the user moves it into a certain position, which gives this facet great functionality. It is the type of design one could see being used more and more of in the future, however, at a price of $925 USD, the price will need to come down for it to become more mainstream. This tap designed by Smith Newnam is currently just a concept tap, so don't go planning it into your new bathroom! The water controls are very unusual and unique in concept, where the water pressure is controlled by moving the metal ball to the edge of the frosted glass, and the temperature of the water is adjusted by moving the metal ball around the circumference of the frosted glass. As with a few of the other tantalizing taps on this page, the colour of the frosted glass changes with the colour of the water. I don't know if that metal ball could be connected to the frosted glass in any way, but I could see there being lots of problems with the ball going missing, especially with kids, or if it were in a public place. I could imagine the kids collecting these little metal balls and swapping them in the playground at school! I would love to have a go at this one; a very original idea. 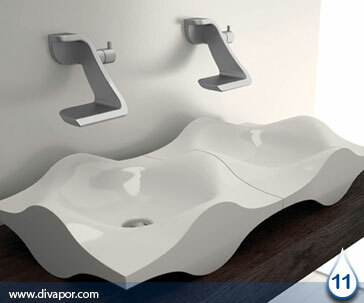 This is more of a wash basin than a tap, but it's so extravagant that it has been added to this page. After looking at the image I could help examine how the water gets drained away. In the photo the water obviously runs down the 'washbasin' which then drops down into a drain. The drain looks like a standard drain in a swimming pool or a wet room with a grating effect on it. My qualm would be the possibility of the water hitting the grate as it fell, causing a little bit of splashing on the bathroom floor, which could obviously become slippery. All this being said, I'm sure you can install your own drain to work with this, and let's be honest, it doesn't look pretty impressive. The Abisko WashBasin isn't so much a basin; it could work quite well as a water slide for small animals (don't do this!). When you look at this tap, do you think of Mercedes Benz? Well the former head of design at Mercedes designed this tap in partnership with Bruno Sacco of Hansa. 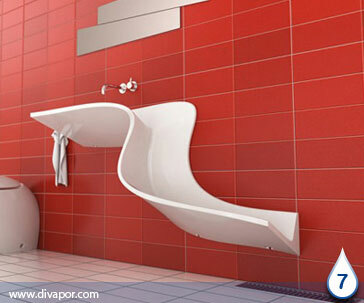 The Octopus Design is classy and could be used in cutting edge bathrooms or restrooms. The HansaLatrava doesn't have any dials or knobs, but rather uses LED water temperature technology to control water flow and temperature. 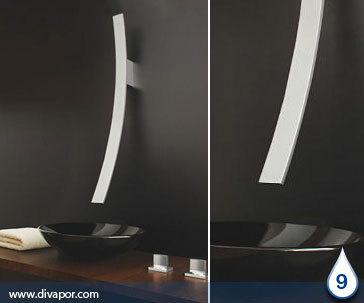 Graff's Luna faucet certainly does capture the imagination with its highly unorthodox design. It really does look highly impressive at over 90 cm in length it may not be to some peoples taste. This special tap is controlled by two standard faucet controllers. 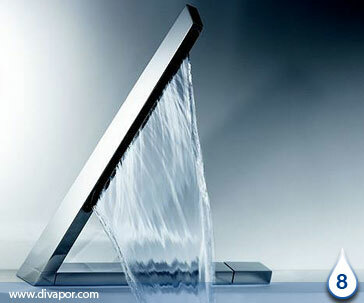 A lot of bathrooms have their washbasins in front of a window; therefore its practicality would be obsolete for many. For all of the people out there who appreciate their flowers, I present to you this tap by Hego Water Design; designed by Davide Vercelli. The entire faucet is transparent, including the resin handles. The main facet permanently holds water inside it, and as new water is pushed up through the base, water cascades down into the washbasin. The tap has its advantages and disadvantages. 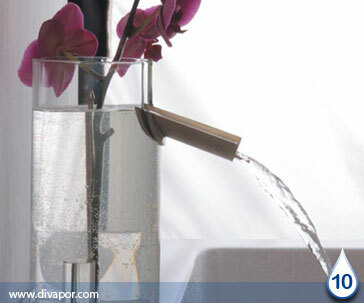 Advantages: Your flowers will always be watered with fresh water (if you use flower with it); It's unique. Disadvantages: If the tap isn't used much, algae and slimy build up would gather on the inside of the clear faucet, making it look dirty; not something you'd wash you face with! Bandini's Ocean washbasin and tap set is very unique. 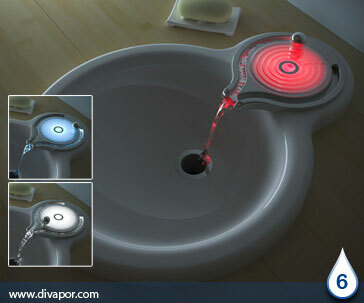 The sink looks like a flowing ripple or wave and the taps look like, well, to put it plainly, a sand wedge golf club. Make of it what you wish. Slow the Flow by Fabio Novembre is like Marmite, you will probably either love it, or hate it; then again, you may just think it's okay! 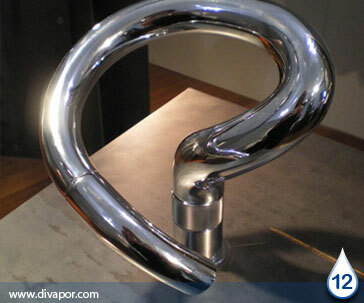 The design doesn't capture the essence of cutting-edge faucet design as it almost resembles a bent silver plumbing pipe. I'm sure in the right scenario it would look fantastic, but for the average Joe's bathroom, it doesn't look like it would fit.